Keeping a fleet of trucks and vans clean is a major undertaking. While the number of vehicles involved will have an obvious impact on how to maintain that fleet, it is important to understand that only a high-quality fleet washing service is going to ensure standards are maintained. Why is this important? Well, it’s about not defeating the purpose. There are clear benefits to maintaining high standards, from enhancing your commercial image and increasing aesthetic appeal to even improving the fleet safety from the perspective of both drivers and road users alike. It’s a subject we covered previous blog post. Of course, not all fleet washing services are created equally. What is good enough to deal with the dirt and grit commonly picked up by a fleet of commercial delivery trucks is not necessarily going to be good enough to handle the soils that cover a fleet of dump trucks. Value for money is another influential concern, and one that is relevant to all businesses, so going for a fleet washing service that charges less is tempting. However, all too often, lower prices translate to poorer quality washes and may even only succeed in damaging the vehicles being washed. At Velocity Chemicals, we advise customers to prioritize quality. And the good news is that it does not have to mean excessively high prices. Here are some of the reasons why doing so is worth it. Cleans Effectively – all of the dirt and grime that is soiling the vehicles are removed completely, leaving the vehicle with no surface streaks and an as-new appearance. Causes No Damage – a fleet washing service that knows what it is doing will always know what detergents to use to properly remove stains and grime, and avoid any corrosive damage. Lengthens Vehicle Life – properly washing your vehicle is a key part of keeping it in top condition. If the washing service is high quality, that can mean real benefits to the vehicle itself. It translates to a longer lifetime for vehicle parts. On the face of it, a lower-priced fleet washing service is going to cost less. Even if you have a chemical cleaner with a very good dilution ratio, and thereby enjoy an excellent per-wash rate, the consequences of choosing a poor quality vehicle wash service can prove to be extremely high. The reason why a fleet might be washed for a low price is that the washing detergent being used is low grade – for example, bad caustic cleaners and acid-based detergent. But these chemical products are generally highly corrosive. This means that everything washed with the product is subjected to corrosive chemicals, and over time this will take its toll. From the graphics on a vehicle’s corporate paintwork to the stainless steel panels on the truck’s panels, corrosion will have to be deal with. This may be replacing the panels, costing thousands of dollars each, or maintain the paint work at a regular frequency. So, in practice, the lower grade wash may get a fleet clean on the day, but in the long run will cost you several thousand dollars to repair damaged surfaces. Choosing the most professional fleet washing service comes down to asking the right questions. So, we’ve put together a short list of the key ones to pose to a candidate service provider. Can You Manage Our Fleet Size? 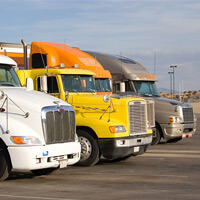 A large fleet needs a large service provider because it needs to be able to handle a high turnover of vehicles. Ask them what their capacity is. Can You Adapt Your Cleaning Methods? As mentioned earlier, the type of environment a vehicle frequents will impact on the cleaner type and strength. The method therefore may need to be flexible. What Cleaning Products Do You Use? The products used should not cause damage to your vehicles. See below for what a quality service should be using. Are You Eco-Friendly? This is an important factor. Detergents that are biodegradable and less environmentally hazardous mean a green reputation for your business. So, ask about water usage and pollution risks. Is Your Staff Trained? The candidate fleet washing service provider should be staffed by certified trained and experienced personnel. Check that they have the right credentials. Is Your Equipment Serviced Regularly? Poorly maintained equipment leads to poorer results. It can also mean breakdowns which will cost you time, and possibly money. When it comes to identifying the chemical cleaning products a service be using, we have a range that our leading fleet washing clients stock up on. These products are not only effective but also efficient and environmentally friendly. They have all been designed to remove the toughest dirt and grime without damaging metal surfaces or paintwork. COMMANDO – a highly concentrated, high-foaming detergent that is ideally suited for brushless pre-spray and wand wash cleaning and degreasing. Removes road film and light oil or grease from vehicles in truck and car washes. ETCH FREE II – an acid based cleaner for use on acid resistant surfaces. It can be used for dip tank cleaning of aluminum or used for cleaning polished aluminum, chrome and stainless. 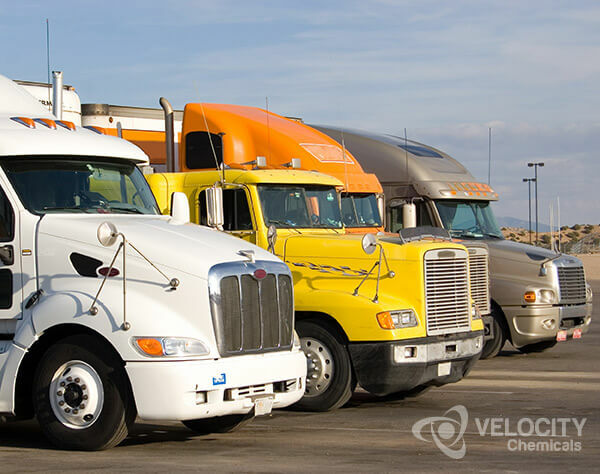 For more information on Velocity Chemicals product your high quality fleet washing service should be using, talk to one of our team at 1-888-963-9499, or email us today!